Hey, folks. My latest book, Crimson Dusk, is coming out this week. And I decided to post an excerpt of the upcoming book. You can also pre-order a copy for yourself via Amazon. The Kindle edition will come out soon after this week. If anyone out there would like a signed copy of the book, then please let me know and I will sign and mail it to you. If you’re on Facebook, you can also join the event party happening and maybe win some free swag! Also, I posted a drawing I did of the main character, Kalek Desmarais, below, after the excerpt. I also posted a DJ Mix I did of music I did, dedicated to the novel. Until next time! The journey to the queen’s citadel stretched onward towards the horizon. A small carriage passed through the landscape not of sand dunes but of flat, blasted earth left parched and cracked by the sun. This land was a mummified corpse produced by the horrors of a former and long- past Great War. The vampire Avus could sense the dark and somber clouds above crying hysterically, followed by rippling thunder and clusters of flashing lightning. Avus was suddenly seized from his daydream, by a twisted, harsh, and inhuman tongue which drew his attention. “What is it? Why have we stopped?” Avus questioned, annoyed. Avus quickly emerged from the carriage and into the stormy atmosphere that hovered over the mountainous range and bridge they stood on. Ahead of the bridge appeared to be the remains of a fresh disaster upon a village that lay ahead of them, and he eyed the smoke that twisted into the sky. Avus was clad with a dark cloak flung over him. His dark, jaw-length hair framed his brooding but handsome face. His cloaked subordinate and bodyguard, Samech, sat on the driver’s seat, guiding the armor-clad horses that pulled with brute force. Avus peered into the darkened heavens and noticed the storm blocked out any source of light from the sun’s rays behind them. They both continued their way through the outskirts of the rubble-strewn road that lead into the flaming ruins. Smoke permeated, choking the sky until the sun struggled to breathe. The tall, dark mountains were obscured by the smoke and flame that filled the scene below. Skeletal buildings sagged as their burnt structures gave way. It was a scene from a nightmare, carnage everywhere. It was the aftermath, and the scene seemed almost tranquil, fires burning and smoke rising from the ruined ground. Bodies of men and women alike were strewn about the filthy mire, like dolls after a child’s playtime. The lifeblood of thousands moistened the packed earth and the feet of the same thousands churned it into a viscous soup. Flies gathered in the eyes of the dead, greedily stealing the moisture. The dead became a home to eggs and writhing maggots. Crows congregated in the field, croaking hoarsely with delight at this splendid feast set out for them. Cruel beaks plunged into eye sockets, gobbling the soft contents. The stench was horrific. The air was rank with sweat, blood, fear, and decay. This village, once bustling and busy, now belonged to the dead. Not even a rat scurried amid the debris. The fire destroyed everything. Flocks of carrion-hunting ravens swarmed over the area, landing upon the ravaged lands, feeding upon the bodies. Avus walked away from the carriage and into the burnt village, stepping over charred bodies of villagers. Samech watched his master carefully, studying his every move. The horrible stench of burning flesh assaulted their senses. “This doesn’t seem like the work of one of our own, now does it? These bodies aren’t drained,” Avus noted. “The storms are beginning to die down.” Samech replied. Without warning, a hand dug its way up from Mother Earth’s womb like a sprouting plant and grasped Avus’ boot. Avus instantly hurled himself back and frowned. “What was that?” Samech asked in dismay. “I guess they missed one.” Avus prepared to draw his sword with caution. Samech followed suit and leveled his serrated spear against the sudden movement of the dirt. “What regents? Tell me your name,” Avus asked, seeing if the man could remember anything of his past. Large, gaping wounds covered Kalek’s torso, neck, and face. He took out a handkerchief and wiped away the dirt, blood, and spit that covered his exhausted face. “Kill me,” Kalek mumbled in between heavy breaths. “They should have finished the job.” More blood leaked from various orifices, including his eyes. “Your wounds are deep—perhaps deeper than your regeneration factor can handle,” Avus noted. In an act of pity, Avus picked up Kalek and carried him to the carriage with all his strength, placing him inside a black and intricately detailed casket hidden inside. “What are you doing?” Kalek asked, barely audible. “Today, fate is on your side. Your number isn’t up yet.” Avus went inside and closed the door. Samech partially revealed his blood-stained fangs and hoped he would come upon a hapless mortal for his delight and sustenance. He sat himself down again upon the rider’s seat of the carriage and signaled the horses to continue down the burnt and ruined roads and crop fields. Kalek closed his eyes and plunged deep into his unconscious night sea sojourn. The council said nothing. There were five beings wreathed in shadow save for their eyes, which reflected the moonlight with a demonic malevolence. They were seated amongst the branches of the surrounding trees, completely silent like a congregation of living gargoyles. They didn’t even seem to be breathing. Still no answer; the tears streamed down his face. They only looked down upon him in his utterly helpless state. He was an infant in terms of pure power to them; if he chose to fight his way out, there would be no hope at all. And it would be worse: They would break him and then imprison him, and with no fresh blood, he could not heal to such an extent. No matter. He would try to run anyway. Fear always distorted logic—sometimes for the better, sometimes for the worse. The vampire broke into a run, a sprint that not even the swiftest of beasts could hope to achieve. Running through the forest, his head was down, arms pumping madly at his sides. He tore past trees, leaping their roots, and skidded on fallen leaves in his mad dash to escape. The tree limbs slashed through his clothes in dozens of places, but his supernatural regeneration already healed the cuts and scrapes. He was caught before he reached the outskirts of the forest; the Elders, as they were referred to, jumped from tree to tree gracefully. He kicked and bit and thrashed and screamed at the top of his preternatural lungs, shaking the nearby trees and waking villagers for tens of miles around in the serene valley but to no avail. He broke loose once or twice but got no more than a few yards before he was caught again. Then, they started to beat him. They wanted him to see his punishment, so they directed their strikes to the lungs and throat rather than the skull. They would not murder this vampire. Rather, they would drain him of his blood, leaving only enough for him to remain aware, and then, they would ravage him until he could no longer repair his own wounds. First the lungs to impair his voice, then the arms, legs, fingers, neck. A mound of flesh and bone—undead flesh and bone—trapped for one thousand years as per the council’s verdict. One thousand years. He couldn’t comprehend the number; he hadn’t even lived that long yet! So much was the fear of the oncoming doom that he could no longer feel the pain. The number kept running through his mind. He dissected it into months, weeks, hours, even to the seconds he would spend in isolation. It was more than torture, even for his kind. They were dragging him across land now at a great speed. He could barely see any more though they did leave both of his eyes. How long was it? It didn’t matter; he’d been cherishing and loathing every moment the wind swept by and through his body. But as all things must, his journey came to an end. “Cu interneric vas vilieridel ai valaeridine. Mass vilahar cu tinoel,” the council said in unison. There were other sounds there: the remaining blood pumping in his ears, the labored breathing to keep the cells alive, the gentle wind, and the water. The sound of water pushed and pulled at the shore, but the shore wasn’t near him; it was above him—hundreds of feet below the surface. There was a dull thud next to him and the sound of chains. It began. They were doing to him as they had done to few before: condemning him to a limited death but far worse than any Hell he could imagine. He had done it to one before. Well, he had been on the council. The only thing he physically did was say the final doom: “Cu interneric vas vilieridel ai valaeridine. Mass vilahar cu tinoel. The moon has set, and the new sun rises. Live to see the moon rise again.” Now, it was his turn to be bound to a locked, silver sarcophagus—the Stone of Condemnation littered with sacred inscriptions. The water quickly swept around his body, dragging him down into the watery depths of the seemingly bottomless darkness and would reemerge upon the shores of a new land. “I have committed grave sins, enough that even tyrannical kings would blush at. They are sins black enough to blot out the brightest sun. I despise what I am, what I was made to be. I once thrived in prowling the shadows, roaring like a lion, ready to devour,” Kalek admitted to the aging sage as he faced downward to the intricate designs of battling dragons. “This is remarkable. You yourself are vampire immortal, and yet you detest all those like you. The majority who are born in the miasma of Hell stay in Hell, totally unbound,” the gaunt-faced, cloaked man declared calmly after a brief period of meditation as he sat cross-legged underneath his vestments of white robe and red, gold dalmatic as he placed his hands palm to palm and raised them above his head and slowly brought them down while continuing, “The chrism light sacrament is meant for the living, not vampire.” The hooded priest’s voice echoed hollowly in the large antechamber, filling the silence with an eerie portent. Kalek growled with certain disdain swirling in his mind, just begging to withhold blood-curdling conviction beneath his furrowing brow. “I am not a lowly, monstrous thrall or ghoul unable to stand against the faintest trickle of light. Only but a few years ago when I was still exiled had I learned to barely control my darkness.” Kalek paused to take in the cindering fragrance that came from the burning incense within the golden lamp beside the altar and rose. “Fair enough.” Kalek retracted the curved, golden blade of the spear and placed it upon an altar. “No soul can be eternally cursed, for nothing is permanent. The stings you have felt from your betrayal—you’re longing to know your families’ clandestine fortunes, the desecrating dregs of unending thirst for blood. They are the imprinting desires and attachments left from your ego that is your shadow. Wisdom is its own reward. Ignorance damns itself. God can convert and save the worst of sinners—even vampires. Are you prepared to slay the demon and channel the light from the darkness?” the hooded sage asked Kalek, who sat cross-legged with his head lowered pensively. Inside the phantasmagoric chamber of the castle, the raven-black eye of Kalek opened. A slender, feminine form watched him in complete silence, wondering if he would recognize her. Thoughts of his past conjured up within Kalek’s psyche, utterly ravaged in the onslaught as if the Armageddon opened its sweeping mouth. A waltz of advanced mechanical rings surrounded the vampire that emanated sound vibrations, repairing the damage of his cursed flesh while Kalek made a sidelong glance over Cressida as he heard a voice call out his full name. “Kalek Desmarais, I see that you’re awake. You’re the only survivor.” The figure in his blurred vision, divorced from clarity, became more apparent as it moved closer. Kalek merely stared into nothingness as blood trickled down the side of his mouth. The queen placed her hand over the smooth, rotating sphere, and the vibrating treatment stopped. She placed her cold, pale hand on his face, removing trickling drops of blood from his mouth and, in a suggestive manner, licked it from her finger. As Halloween on October 31 approaches, I am currently in the final stages of preparation to publish my newest book, which is a work of supernatural horror/post-apocalyptic fiction. 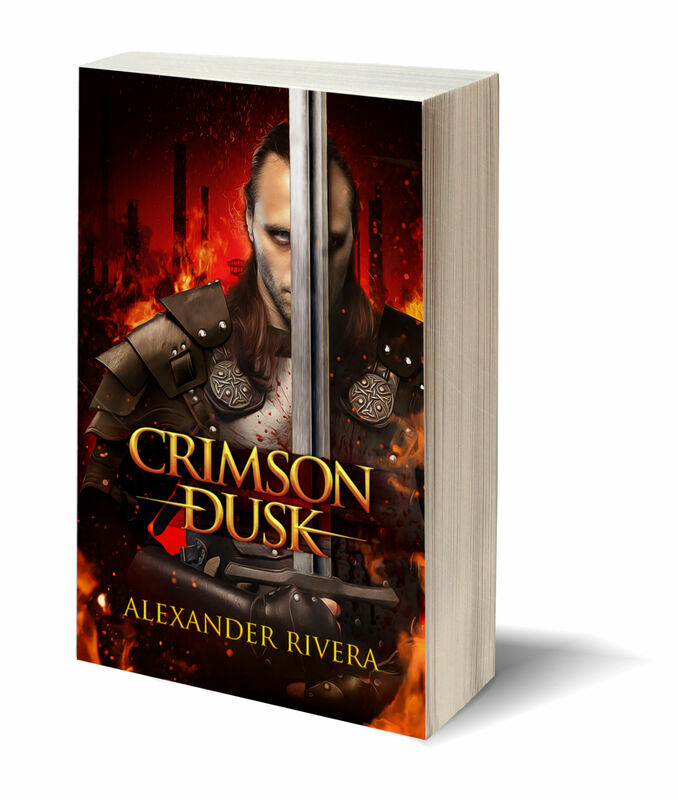 The book is called Crimson Dusk, and it has been in the making and on the creative back-burner for some time now, but I feel it is now the time to finally release this book for all to seen and read. It is slated to be published later this month, in October 2016, on the 27th. Very soon, all my dreams and fantasies of seeing this book published is becoming more real, as each day passes. The book (and future books) will be published under my own publishing company, Megas Aeon Publications. That is to say I am still open to publishing books with other companies, but this publication will be the base of operations for my own work. In the meantime, I have to share the cover because I think it is too beautiful. It depicts of the main protagonists–Kalek Desmarais. I found a gifted/genius artist, Dean Samed, whose work humbles me. He is a dedicated cover-artist and has carefully crafted a cover that I couldn’t have asked for any better. I must also thank Shawn King for his superior work on the interior design and Amanda Shore for her careful editing of the book. Shout-outs to Tracy Twyman for her help and guidance on setting up the publishing side for this book. Here is the link for pre-order. I will be posting more information about the book, free short stories and excerpts associated with it, as well as artwork, in the coming days. The covers and the back-cover blurb is below. A new, dark age has been unleashed. The vampire nobility has risen from the ashes of the fallout from a previous devastating world war, instigated by humanity. Kalek Desmarais, a vampire warrior and explorer has faced his mortality, numerous times, but his recent brush with death has left him in wave of dismay. His recent discovery of a hidden Necropolis, which housed a sword of forbidden power, otherwise known as “Pandemonium,” was said to belong to an ancient fallen archangel, Melcier-Adonin. The sword was forged from the dark heavens only to be rediscovered at a newly fated Armageddon. Against this backdrop is the fight between ruler against ruler, authority against authority. Servants of Melcier-Adonin are paving the way for his final resurrection. There are wanderers, like thieves in the night—belonging to an ancient lineage of Light and Heaven—prepared to fight these powers, along their pilgrimage for salvation.